Barry Knight, Director of the Webb Memorial Trust, contributed a chapter to Effective Philanthropy: Another Take published in April 2016 by Philanthropy for Social Justice and Peace to coincide with the 2016 European Foundation Centre conference in Amsterdam. Effective Philanthropy examines international stories of successful grantmaking and complements the recently co-published Grantmaking for Social Justice and Peace: Approaches drawn from shared practice. Despite many efforts over the years, child poverty remains a widespread problem in the UK. Public support for the issue has drained away and anti-poverty groups have lost their way. In an attempt to break the logjam, the Webb Memorial Trust decided to support efforts to make the voices of children themselves heard. This story covers four years of activity, from an initial grant to support a children’s conference in 2011 through to the launch of the Children’s Manifesto in Parliament in October 2014 and a major conference in March 2015. One important result was to raise awareness about the value of children’s views. Another was to challenge our stereotypes of what children can do if they are given the chance. Some of the most marginalised in society were given a voice and encouraged to participate in discussing how their society should be run. Children were not just consulted; they took a real lead. The adults involved were fully convinced of the value of children’s views. The work did not proceed according to a cut-and-dried theory of change; the process was very flexible. In the UK, a powerful lobby of interests concerned with child poverty has existed for 50 years. An interconnected web of charities and political organizations monitor annual statistics on child poverty and pressure the government to do more to ensure that every child matters and has the opportunity to live a flourishing life. 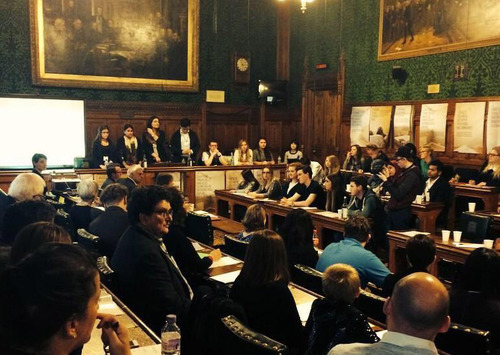 The launch of the Poverty Ends Now children’s poverty manifesto at the Houses of Parliament on 15 October 2014. Over the years, the child poverty lobby has been successful in improving the quality of life for many children. But in recent years, the debate about child poverty has become, according to one foundation leader, ‘angry and fruitless’. Child poverty remains a widespread problem in the UK. The goal of the Webb Memorial Trust is to rethink and reframe how to tackle poverty so that others may advance solutions to the problem. As a small educational trust, our role is to produce educational materials showing how things might be different, and to open up discussion and debate that eventually lead to social progress on structural issues that lead to poverty and destitution. The work of the Trust fits well with a social justice agenda. The persistence of poverty in a modern, wealthy democracy is, according to our research, seen as unfair by the vast majority of the population. In the story that follows, the key concept for us is ‘empowerment’. Our aim is to achieve social justice through increasing the social, economic and political strength of those who have been marginalized in society. So for us the goal here is to give a voice to these individuals and groups, to enable them to participate, to be part of the process – rather than any specific outcome that might be achieved through the process of participation. It would be wonderful to claim that the Trust’s work on children’s empowerment unfolded as the result of a crystal-clear theory of change that was implemented as part of a rigorous top-down plan with built-in evaluations at various stages. But this would be far from the truth. The programme evolved organically in response to conversations about applications, chance meetings, and opportunities that emerged. Work with children’s voices began almost by accident and was fitted into the Trust’s wider agenda to investigate what a good society without poverty would look like from many different perspectives. It started in a café. Representatives from the Trust met people from a children’s charity based in the North East of England, Children North East, to discuss their request for a small grant to celebrate their 120th anniversary. They wanted to bring a big-name speaker from London for an evening lecture. The theme was to be that, despite popular belief, child poverty is not a thing of the past. But we questioned whether an evening lecture would have the desired impact and offered a larger grant for a full day’s conference to enable more extensive discussion. For their part, Children North East suggested that children should play a part in the conference – both in preparing for it and on the day itself. We were unsure about this, but we went along with it. The conference was a success, and there was widespread agreement that the stand-out contributions came from the children. One of these was a photographic exhibition based on the work of 1328 children from across the North East, each of whom was given a disposable camera to document and record their lives. The other was a play, Hope’s Diary, about a 12-year-old girl whose dreams of advancement were everywhere constrained by lack of money. There was immediate demand for the exhibition and the play from a wide variety of organisations. The play, featuring young actors from the North East, was shown in Parliament and had a strong emotional effect on the Members of Parliament who saw it. Another positive outcome of the conference was the development of an online resource on ‘poverty proofing’ schools. Two years later, 27 schools in the region had registered to take part. Schoolchildren took action to deal with the problem of fly tipping (illegal dumping of waste) in their communities. With financial support from the Trust, Children North East developed Hopebook. This works somewhat like a social networking site. You become friends with Hope, who posts about her life and experiences. You can play interactive games which highlight the obstacles faced by children growing up in poverty. The goal is to stimulate discussion of poverty among children using a medium that they already use. In a different part of its work on poverty, the Trust decided to support the All Party Parliamentary Group on Poverty. Poverty is a contentious issue politically. The consensus that led to all party support for the Child Poverty Act 2010 crumbled almost as soon as the Act was passed. A division opened up between those who believe that the state is responsible for ending poverty and those who believe that the responsibility lies with individuals. To make progress, two trustees of the Webb Memorial Trust, Kate Green MP (Labour) and Chris White MP (Conservative), wrote a helpful article in the New Statesman acknowledging that ‘all parties have fallen short of their goals when it comes to reducing poverty’ and that now was a good time to start building ‘a new politics’. Kate Green then became chair and Chris White vice chair of the All Party Parliamentary Group on Poverty, while I, as director of the Webb Memorial Trust, became adviser. We developed a programme of work that aimed to produce areas of agreement between the parties. We decided to focus on the role of business in reducing poverty, the role of civil society in reducing poverty, and children’s views on reducing poverty. All of these areas were ‘safe’ politically in the sense that there were no clear dividing lines that would mess up the process. This focus was ideal for the Trust as an educational charity. It offered a new way of approaching the issue of poverty, rejecting the blame game played by anti-poverty campaigners and seeking solutions that would work for everyone. 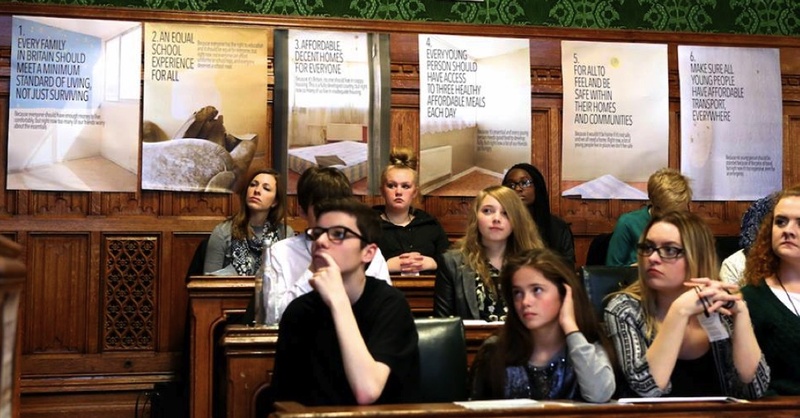 Early discussions within the All Party Parliamentary Group suggested that a ‘Children’s Manifesto on Poverty’ would be a useful device to harness the views of children. This could be prepared in advance of the 2015 general election and be used in a non-partisan way to tell politicians what tomorrow’s voters thought about the issues. The Trust had no expertise in participative work with children, so we talked to people with expertise in this area about how to approach this. We wanted to work with people who would be able to help children express their views, but without interfering with the content of what they wanted to express. In the event, a team of two people led the work, Sara Bryson and Rys Farthing, and Children North East received the grant. Thirty-eight young people contributed to writing the manifesto, based on the work of a wider group of 180 young people who met between 2012 and 2014. The children came from five areas of England – all with long-standing problems of poverty and deprivation. Children and young people did all of the work; though adults were on hand to offer guidance, they were careful not to control decisions. The work culminated in a document called Poverty Ends Now (PEN). The name was chosen because the young people felt that it was commanding, short and catchy for social media purposes and also because the PEN acronym matched what they were doing – writing. To implement their findings, the children planned three national actions: a launch of their manifesto in parliament, tabling parliamentary questions and writing an evidence submission, and undertaking a national media campaign. The All Party Parliamentary Group provided a forum for the national work. The children also planned six local actions based on the six themes that emerged as central to young people’s concerns: decent incomes in Liverpool, affordable housing in London, equality at school in the North East, healthy food in Gateshead, feeling safe in Manchester, and public transport in Newcastle. The manifesto’s six principles were derived from the life experiences of the young people. Unlike many people who write about poverty, young people ‘tell it straight’ based on their own authentic experience and emotional connection with the issue as opposed to detached thought. The document also reflects the fact that children see things differently from adults. They lack the theoretical baggage that adults tend to carry, avoiding quibbles about the best definition of poverty. Instead they tend to focus on immediate, concrete things like the lack of food in the fridge, the inability to go on school trips, or the embarrassment of bringing friends home to a flat with rising damp. Things that have little place in the poverty debate among adults, such as love from parents or caring for pets, are very important to children. They also feel that whatever is wrong should be fixed now. The title of their manifesto, Poverty Ends Now, speaks to an immediacy that is rarely present in the policy debates of adults. All of the local projects were successful in raising awareness about the value of young people’s views. In Liverpool, for example, young people developed a play called Brass Razoo, performed to a full house in November 2014. Trade unions saw the potential of using the play to promote discussion of the issues and gave the group financial support to enable a second performance at a 1,000-person capacity theatre. In Manchester, the police commissioner worked with the group of young people on issues ranging from sexual exploitation to park lighting. In the North East, on the advice of their local MP, the group conducted a questionnaire in their own schools and colleges to gather evidence about the impact of poverty in schools. They spoke to over 1,000 local young people, analysed the findings and organized a local evidence session with 60 regional decision makers. They presented their findings to the chair of the Social Mobility and Child Poverty Commission, Alan Milburn. The group has now been offered funding by the North East Child Poverty Commission to continue meeting over the next year to act as a shadow youth board of the commission as well as continuing their work on the manifesto priorities. All local events engaged local councillors, MPs, teachers and others in their activities and events, and attracted local press coverage. Nationally, the work raised awareness of the issues, though there is less evidence of lasting outcomes. Poverty Ends Now was launched on 15 October 2014 at the Houses of Parliament. 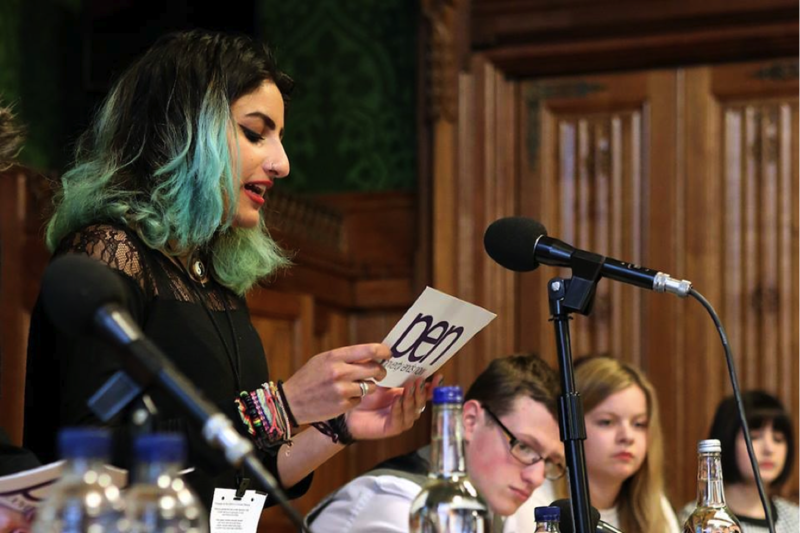 Young people presented the report to a large audience of young people and some MPs and peers, and engaged in a formal questioning of three MPs, one from each of the three main political parties. Although the event was highly successful and had a positive effect on the confidence of the young people, there was no sense that any action would be taken as a result of the work. There is a risk that much effort can go into supporting events and actions of this kind, but that messages, while listened to at the time, have little effect on policy or practice. The problem of adult responses to children was also evident at a conference organised, with Trust support, by the Fabian Society and Bright Blue on 2 March 2015. The conference was opened by a series of moving monologues by eight young people from Merseyside, immediately followed by a panel consisting of Labour, Conservative and Liberal Democrat MPs. Not one of these speakers mentioned the young people’s contribution; instead they moved into a pre-prepared analysis of the problem of poverty. The fourth speaker on the panel, who used to be part of a gang, said that unless politicians listened to young people, they were doing themselves and the country a disservice and the kinds of issues he had experienced in his life would recur in the next generation. This brings us to the vexed question of participation and power: people may be able to take part in political processes, but it does not follow that they have any power to change things. For a small grant-making charity, it may be hubris to think that we can bring about large structural changes in attitudes and behaviour with a series of small or medium-sized grants. Nor can we claim huge results from the process to date. But the process has started and the idea that children have nothing to contribute to political processes has been challenged. The key thing is to continue the process and to build on what has been learned. Efforts to empower politically marginalised groups need to be measured in decades because embedded attitudes and behaviours form large structural barriers. It is the job of all of us to dismember them. The lesson from this brief study is that children do not believe such barriers should be there at all. Biggest achievement: As the children grow older, they wish to use their experiences to train other children to take their place in attempting to get their voices heard!